The passage of the Tax Cuts and Jobs Act of 2017 significantly increased our earnings forecast for the S&P 500 for 2018 from $129.82 to $144.84. We do not expect major changes to economic growth stemming from the tax legislation. Fed policy should continue to tighten through increases in the fed funds rate and a reduction in the size of the Fed’s balance sheet. An increased federal deficit factors into our outlook for softness of the U.S. dollar versus other currencies. We initiate a laddered structure for bonds in strategies where income is a factor. Overall equity exposures remain elevated across all strategies relative to historic allocations. Our sector and industry outlooks favor a growth style bias at 60%. The most significant domestic economic news since last quarter was the passage of tax reform legislation in December, known colloquially as the Tax Cuts and Jobs Act of 2017. While the implications for corporate profitability and a rising federal deficit are substantial and will certainly affect financial markets, our analysis supports the notion that the effects on economic growth will be minimal. 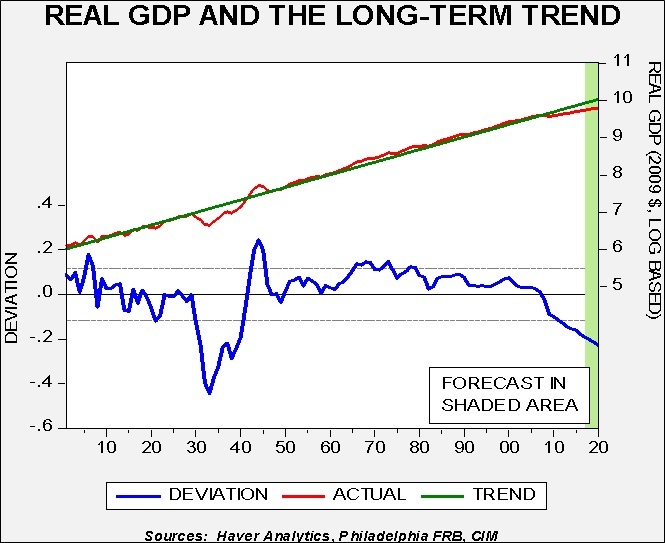 Throughout this expansion, GDP has remained beneath its long-term trend, with average real growth of 2.2%. This slower growth, combined with deregulation and globalization, has encouraged a low inflationary environment, both domestically as well as across developed countries. Our expectations for the year, which help frame our view of our three-year forecast period, is that the economy will remain on its trajectory of modest real GDP growth and inflation will be tame despite a low level of unemployment. Against this backdrop, we expect Fed policy to hold course in raising fed funds and possibly become slightly more hawkish given the changes to the FOMC voting roster. 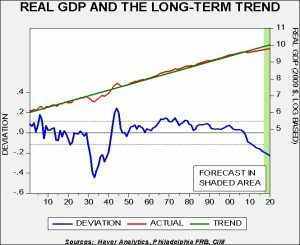 While the potential exists for a policy mistake by the Fed, even with such a mistake our analysis leads to the conclusion that it would not engender an effect until 2019. Although our forecasts for GDP and inflation are sanguine, consumer and business sentiment remain elevated. The conflation of such high sentiment, tax changes and low inflation may lead to what many describe as a “melt-up” in the equity markets. Though fundamental metrics such as P/E or earnings yield underscore the notion that equities in general are fully valued, we note that such conditions may not only persist for an extended period of time, but can become even more pronounced. While this is not our base case, we view the odds as higher than normal. Beyond the U.S., a number of issues harbor some degree of uncertainty, notably the upcoming Italian election and its potential to further splinter the EU, the ECB’s tapering of its bond purchase program and China’s ongoing efforts to control credit growth. Despite these uncertainties, we are constructive on developed market economies. Moreover, based on purchasing power parity, which is a measure of exchange rate valuation based on relative inflation rates, we find the U.S. dollar remains overvalued relative to the euro, pound, yen and Canadian dollar. Regarding emerging economies, there is obviously a wide divergence of economic activity. Nevertheless, in the aggregate, emerging economies are helping to propel global growth and arguably the basket of emerging market currencies holds appeal relative to the U.S. dollar. For U.S.-based investors, a weakening dollar acts as a tailwind for foreign investing. Based on our outlook for the economy and the effects of tax legislation, our expectations for U.S. equities are favorable. 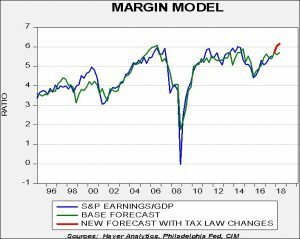 Our updated earnings forecast for the S&P 500 for 2018 is now $144.84, which represents an 11.6% increase over our previous forecast of $129.82 prior to the passage of the tax legislation. 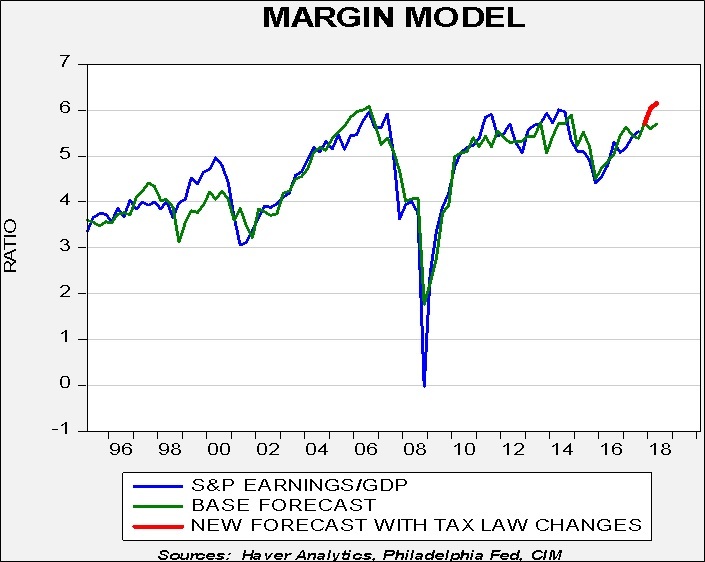 On the accompanying chart on the next page, the blue line shows the ratio of total S&P 500 earnings to GDP and the green line is the forecast from our margin model. This includes productivity measures, global integration, several interest rate variables, corporate cash flow, the dollar and oil prices. The red line shows our forecast impact of the new legislation. As the chart indicates, we are expecting a significant effect, with S&P 500 profits expected to exceed 6%, a record level. Our new forecast is aggressive and is supportive of the continuation of elevated equity exposures across all strategies relative to our historic allocations. With lower corporate tax rates, cash flow will be higher and, combined with repatriated overseas cash, we expect increased dividends, share buybacks and acquisitions, which should be favorable for the stock market. Given our overall outlook for equities, we have moved to a 60% tilt toward growth and 40% to value. In U.S. large caps, we overweight technology, energy, financials and materials. Mid-cap and small cap equities have the same tilt toward growth and are both overweight in the more growth-oriented strategies. Outside the U.S., we retain our historic maximum exposure owing to our expectations of continued softness in the U.S. dollar exchange rate. The rise in Treasury yields since the passage of the tax legislation in December has led many commentators to suggest that a bear market in bonds has developed. Though we tend to agree with this assessment, we believe that a secular bear market commenced in 2016 and the prospect is for a gradual increase in rates over not only our forecast period of three years, but likely beyond. The operative word in the previous sentence is gradual as historically problems engendered by bond bear markets take years to manifest. 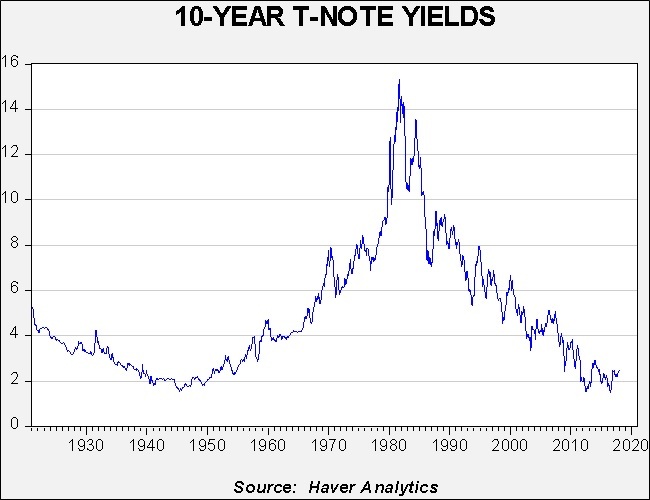 As this chart illustrates, the last secular bond bear market that began in 1945 took over two decades, when yields rose above 5% in the late 1960s, for rising rates to have an adverse impact on financial markets. For a longer term perspective, this chart displays the interest rate of U.K. Consols beginning in 1701. What is notable is that both bull and bear markets for bonds endure for long periods of time. Though the British bond bear market following WWII had enormous magnitude, the length was actually fairly normal. For a more detailed analysis of the potential causes and implications of a bear market in bonds, please refer to our Asset Allocation Weekly report (1/19/18). Over the forecast period, we envision the terminal fed funds rate to be in the range of 2.25% to 2.75%, given the anticipated composition of the Fed’s voting roster. As noted above, we expect a gradual rise in rates over time and, accordingly, have created a laddered core in strategies with income as an investment objective. Bond ladders offer a degree of defense against rising rates through capturing the rolling yield while also allowing maturing issues to be deployed at the longer rungs of the ladder, benefiting from yield advantage. Although the yield curve has flattened and we expect a degree of continued flattening, we still forecast a positively sloped curve that should inure to the benefit of a laddered approach. Through the use of bond ladders, we lessen the overall duration slightly and maintain the concentration in the intermediate segment of the yield curve. Regarding sectors, spreads for both investment grade and speculative grade corporate bonds remain near post-recession tight levels. 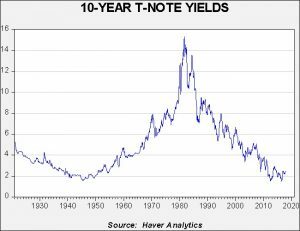 Accordingly, Treasuries are attractive and we maintain a lower exposure to speculative grade bonds. Exposures to commodities are typically helpful during conditions of rapid economic growth and/or surging inflation expectations. As these conditions are absent from our forecast, the strategies have no allocations to commodities.